This week is a really fabulous week. Not only did it start off with a Canadienne Buffet, continue with a washer and dryer delivery, but now the icing on the cake….I have actually found out where exactly we live. March 2011: Lauren instantly takes address from house-hunting documents and enters them into TinyPrint.com to make wedding thank you cards. Hits Order. Second guesses realizes that she forgot to put an actual apartment # as it wasn’t listed on house hunting documents. Emails agency and asks whether she should stop the order to include the apartment #. Agency writes back that the address IS in fact correct, people don’t list their apartment #s. There are none – just your building number. Note: don’t apply for mailmen positions in Switzerland, this would be not fun to figure out for 16-20 apartments in every building. 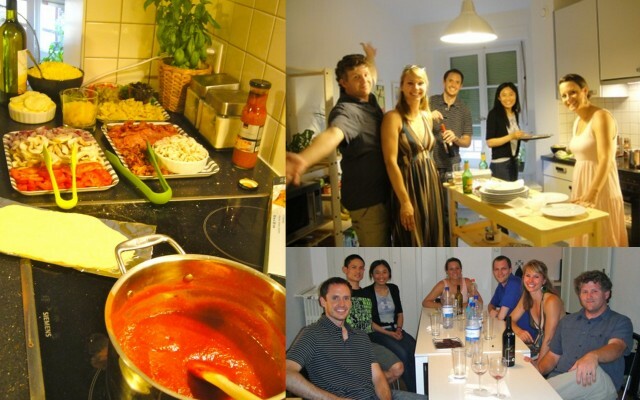 May 2011: Move to Switzerland. Carry one of the little thank you cards everywhere – to get TPG pass, to register for things, as it has the proper address and it is easier than butchering our address or spelling our names aloud in French. Note, registration people also appreciate such effort. May 2001: While in temporary living, learn how to use TPG (public transportation of geneva) site to map out daily transportation. Curious to what buses come to new permanent apartment and try that. Realize that our Zip Code Original doesn’t work. It suggests our address, but with Zip Code 2…..hmm. Houston, we may have a problem. May 2011: Email Agency. WTF? Agency advises to in fact, start using Zip Code 2 moving forward. Give out Zip code 2 when doing the rest of home-set-up. Figure that eventually people with Zip Code 1 will catch on. Realize that most people in the US won’t send us mail, so not a terribly big deal all our wedding thank you cards have the wrong address, right? June 2011: Go on “familiarization” tour of neighborhood with agency. When we get to the post office part, agency advises that they called prior to our day together, and actually Zip Code 1 is correct. Revert to using it. Yeah, all those Tiny Print thank you cards aren’t a waste after all! June 2011: Go to women’s club luncheon. Have new member kit handed back to me as it was rejected when sending to Zip Code 1. Has a very clear note from La Post saying to start using Zip Code 2. Start using Zip code 2 again since they said so…. June 2011: Use Zip code 2 when ordering train tickets. Days later, train office writes me a personalized email (in English!!) saying my tickets were sent back to them. Advise them to use my husband’s name (I am not legally converted yet – story too long for this blog post) and re-send to Zip Code 1. Thank them profusely for their amazing customer service. June 2011: A brilliant idea occurs to me. Our neighbors must know where we live and actually have the right address on their mail. Since the neighbors don’t speak English and we don’t want to confuse them hoping they’ll give us lenience on noise and all the other things we know we’ll do wrong, brainstorm an ingenious idea. [ The rest of this part has been omitted to protect author ] . Confirm neighbors have Zip Code 1. June 2011: Train tickets successfully arrive to Zip Code 1. But, I have to walk four blocks to go get envelope with a retrieval ticket, as it was held at the post office. Even though it was an envelope that would have fit in the mailbox. Bizarre. Conclude that sending mail to Zip 1 with husbands name is the best approach. Mission accomplished…zippity do da dandy. Today was a remarkable day in our Swiss journey. 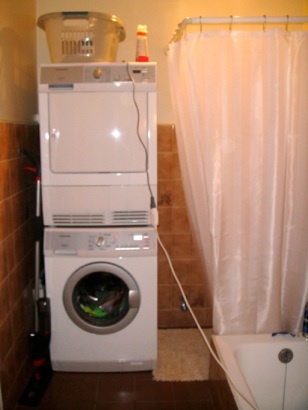 We are not only proud new owners of a washer and dryer combo (which we have been for the last 2.5 weeks). We now have that said purchase actually in our house, installed, and properly working. She had her maiden voyage today. I have named her Zuri, of the French meaning “white and lovely”. Last Sunday, we went to church in Ferney-Voltaire, just over the border in France. We arrived 15 minutes early so went to check out the Carrefour as it was open on Sunday!! 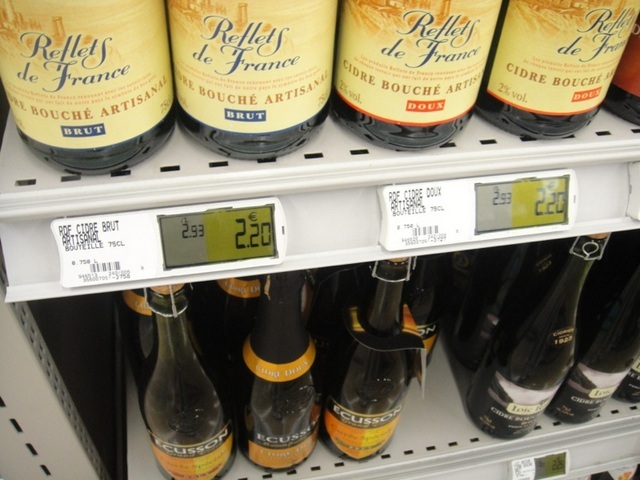 We had never seen digital price tags (above photo) like this. I supposed its so they can change prices (in Euros) quickly with these. I thought about the sustainability aspect, but I am not sure how they are powered. 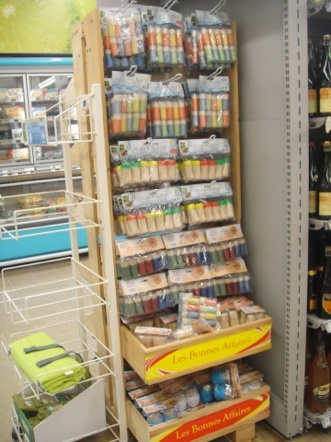 For those reading this blog regularly, you will laugh as just a week ago, I had a post about how I almost cried over toothpicks This is an entire end cap dedicated to toothpicks, in the mixer aisle. Funny how life can give you everything you need, if you are just patient! This Friday, I just wanted to dedicate my post on gratitude to mon mari (my husband). Last night, I was just reflecting on how lucky we were to not be doing the long distance thing anymore. For two and a half years, both of us traveled back and forth from Charlotte and Atlanta. While we love to travel, four hours each way on I-85 is not an ideal experience to have most weekends. During that time, neither of us felt settled in our own cities or with any free time going back and forth. I remember a dream of mine was just wanting to watch a rental movie with Gabe on a weeknight. It was never really possible on our short weekends as we usually had events or plans with friends. Just 8 weeks ago, we were doing long distance. And now, I find myself married to my best friend. And, last night, we watched a rented movie from iTunes, it hit me that all I ever wanted had come true…..getting to live in the same place as the one I love. Each night, I get so excited for him for him to walk through the door. Beyond that, we get this great adventure as our honeymoon. While the move may have its ups-and-downs, it is an incredible thing to experience a new country together. We share all the tough points, as well as the awe of the fact that we live in this absolutely amazing place. And sometimes, usually as we cross the Mont Blanc bridge in our car, I have to pinch myself and say, “we really live here!” and then we both smile. 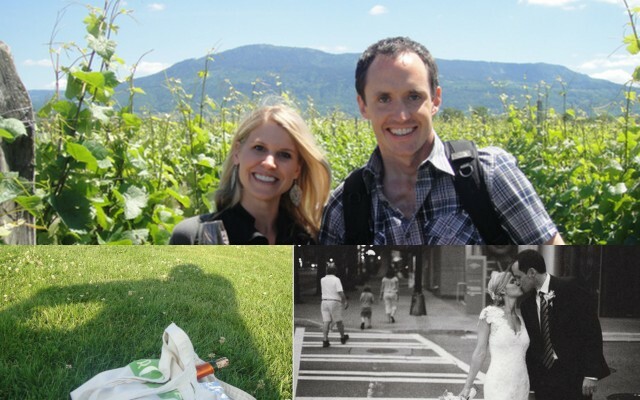 A selection of photos taken in a few week period – our wedding, a picnic and our first weekend in Geneva at Caves Ouverts. So, this week, and every week, I am thankful for mon mari, and all he does to make me the happiest girl in the world. Today at Globo-gym, we had an unpleasant surprise. Ironically, the class I was taking was named F.I.R.E. and I am not quite sure what those initials stand for in French, since the acronym doesn’t mean anything in that language. However, 20 minutes in, the F.I.R.E. alarm went off. A french voice came on the loudspeaker and everyone started moving for the doors. Hmm. No clue what they said but I am pretty sure I should follow. We weaved down stairs and were in the basement of the large department store and we eventually found our way outside to find a huge crowd of people, also from other floors in the building. They ushered us to the lakeside only a block away. Everyone looked down at their feet in dismay. Most of the shoes had never seen the light of day since they have to be brand new and squeaky clean to be worn within the facility. Yes, that was the first thing that popped in my head too during a fire emergency as well. A few minutes later, the suited employees came running out of the building with stacks of towels for everyone. Remember, Swiss people (or at least in Geneva) don’t like to be seen in gym clothes in public. Many of the people in the class with them took them and wrapped them around themselves. Not for warmth…it was 70 degrees out….but as the sweaty attire was not appropriate for the posh neighborhood we were in. My American brain was thinking maybe the instructor should continue class outside – we were wasting precious work out time there!!! I am sure that would have been frowned upon though so I didn’t lead the movement. You’ll be happy to know that it was a false alarm and we all returned in after 20 minutes. Glad I hadn’t taken an earlier class and been in the shower – that could have been super unpleasant without being able to understand and follow the lead. So, this week, I resolve that I will attempt to learn more about emergency words in French so I am better prepared.